On 3 April, 19 politicians from Kayah State graduated from the Myanmar School of Politics (MySoP). These leadership level politicians represent 10 different political parties as well as the Kayah State election sub-commission. They have successfully completed 8th edition of the MySoP core course, a 20-day learning retreat aimed at improving their capacities and constructive, policy-oriented political engagement. The graduation ceremony was held in Ngwe Saung, Ayeyawady Region, in Myanmar. 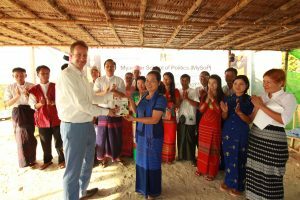 The politicians were awarded their certificates by the Ambassador of the Netherlands to Myanmar, H.E. Wouter Jurgens. In addition, each new alumni was presented a copy of the Myanmar translation of the book Politics Meets Policies. This co-publication between the Myanmar School of Politics and International IDEA (a translation of the latter’s 2014 book by the same title), offers food for thought for political parties that are struggling to shift from personality-based or clientelistic-focused approaches to more programme-based strategies as they reach out to voters. Over the next few weeks, all elected MPs in Myanmar will also receive a hardcopy of this publication. Read the International IDEA publication in English or see the new Myanmar language version here. NIMD wishes its new alumni all the best and hopes to see them soon in its alumni activities, as they further increase their knowledge and capacity on the issues of programmatic parties, intraparty democracy, and dialogue. As such, MySoP takes place in a multiparty setting: all parties with an established presence study and practice politics together in a neutral, respectful setting. In this way, the courses aim to build trust between the different political party representatives, and promote a political culture of openness and cooperation.